Texas Instruments (TI) today introduced four tiny precision data converters, each the industry's smallest in its class. The new data converters enable designers to add more intelligence and functionality, while shrinking system board space. The DAC80508 and DAC70508 are eight-channel precision digital-to-analog converters (DACs) that provide true 16- and 14-bit resolution, respectively. The ADS122C04 and ADS122U04 are 24-bit precision analog-to-digital converters (ADCs) that feature a two-wire, I2C-compatible interface and a two-wire, UART-compatible interface, respectively. These new devices join a portfolio of precision ADCs and DACs optimized for a variety of small-size, high-performance or cost-sensitive industrial, communications and personal electronics applications. Examples include optical modules, field transmitters, battery-powered systems, building automation and wearables. Reduce system size: Both DACs include a 2.5-V, 5-ppm/°C internal reference, eliminating the need for an external precision reference. Available in a 2.4-mm-by-2.4-mm die-size ball-grid array (DSBGA) package or wafer chip-scale package (WCSP), and a 3-mm-by-3-mm quad flat no-lead (QFN)-16 package, these devices are up to 36 percent smaller than the competition. The new DACs eliminate the typical trade-off between high performance and small size, enabling engineers to achieve the best system accuracy, while reducing board size or increasing channel density. Maximize system accuracy and achieve higher reliability: In addition to their compact size, the DAC80508 and DAC70508 provide true, 1 least significant bit (LSB) integral nonlinearity to achieve the highest level of accuracy at 16- and 14-bit resolution - up to 66 percent better linearity than the competition. They are fully specified over a -40°C to +125°C extended temperature range and provide features such as cyclic redundancy check (CRC) to increase system reliability. Minimize footprint: These tiny, 24-bit precision ADCs are available in 3-mm-by-3-mm very thin QFN (WQFN)-16 and 5-mm-by-4.4-mm thin-shrink small-outline package (TSSOP)-16 options. The two-wire interface requires fewer digital isolation channels than a standard serial peripheral interface (SPI), reducing the overall cost of an isolated system. These precision ADCs eliminate the need for external circuitry by integrating a flexible input multiplexer, a low-noise programmable gain amplifier, two programmable excitation current sources, an oscillator and a precision temperature sensor. Improve performance: Both devices feature a low-drift 2.048-V, 5-ppm/°C internal reference. Their internal 2 percent accurate oscillators help designers improve power-line cycle noise rejection, enabling higher accuracy in noisy environments. With gains from 1 to 128 and noise as low as 100 nV, designers can measure both small-signal sensors and wide input ranges with one ADC. These device families, which also include pin-to-pin-compatible 16-bit options, give designers the flexibility to meet various system requirements by scaling performance up or down. 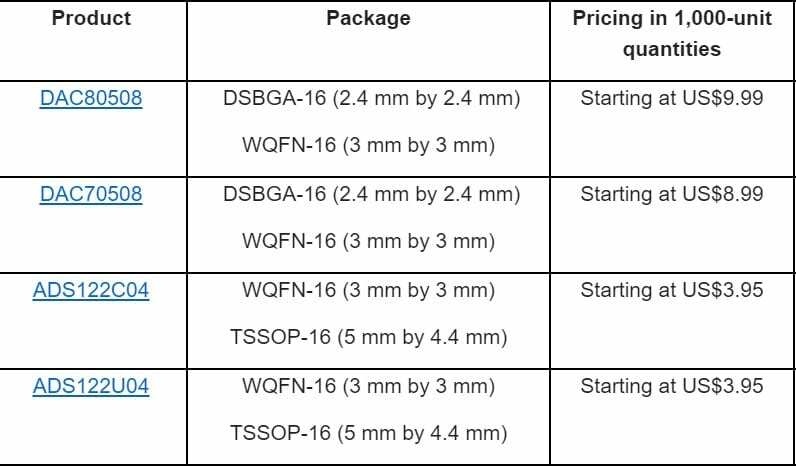 TI's new tiny DACs and ADCs are available with packages and pricing as listed in the table below. The DAC80508, DAC70508, ADS122C04 and ADS122U04 devices are available in production quantities through the TI store and authorized distributors.